Who knew Microsoft Word could give you a power rush? That’s what you feel when you create a one-click, customized Style Sheet that automatically applies font, paragraph, layout, and other settings to any document. It’s a great way to create consistency for monthly reports or other routine pieces of content. Once you get the hang of Style Sheets, formatting text one paragraph or section at a time will feel as primitive as Sumerians writing cuneiform on wet-clay tablets. 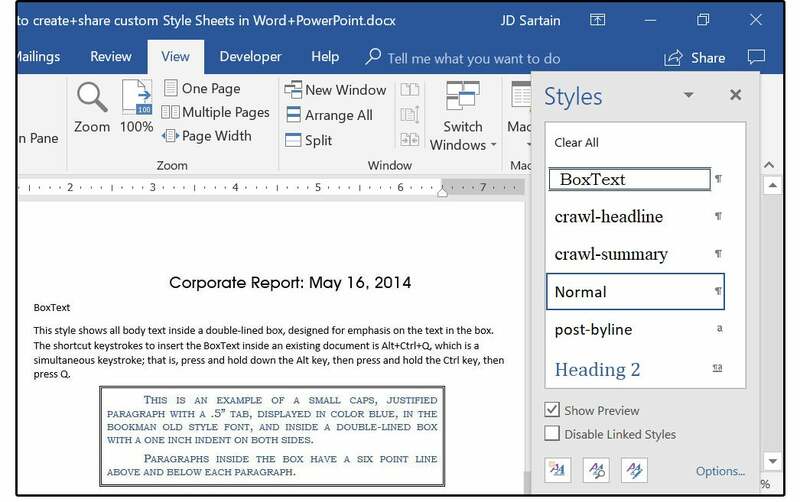 Style Sheets also work in PowerPoint, and we'll show you those as well. In Word 2016, the process for creating styles and Style Sheets is similar to the processes in Word 2010 and 2013. Veterans will recognize most of the commands, and novices should catch on quickly, especially in the user-friendly Word 2016. The only real differences (aside from the aesthetics) are the location of these features on the menus, the addition of many new templates and themes that use Style Sheets, and some new options that make this feature more proficient and accessible. Imagine that you must create a weekly report for your branch of the company that will, eventually, be merged into a bigger report for the corporate offices. The CEO has instructed you to create a Style Sheet for everyone in all the branches to use, so the reports can be merged seamlessly with minimal reformatting. For the sake of brevity, we’ll create just one custom style for that Style Sheet. You can then use these instructions to create all the remaining styles such as titles, subtitles, and so on. On the Home tab, click the expansion arrow in the lower right-hand corner of the Styles menu. 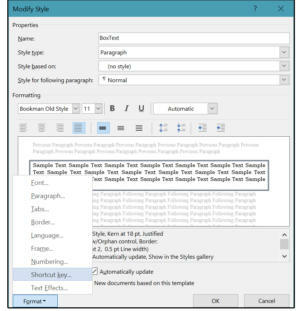 The default Normal Style Sheet panel drops down and displays a list of all the paragraph, character, link, table, and list styles in that Style Sheet. You can add new styles to this Style Sheet or modify the existing styles and save them under a different name. Or you can clear these styles and start fresh, then re-save your custom Style Sheet with a new name. For this example, we’ll just add new styles to the existing Normal Style Sheet, then re-save it as the “Corp Report” Style Sheet. 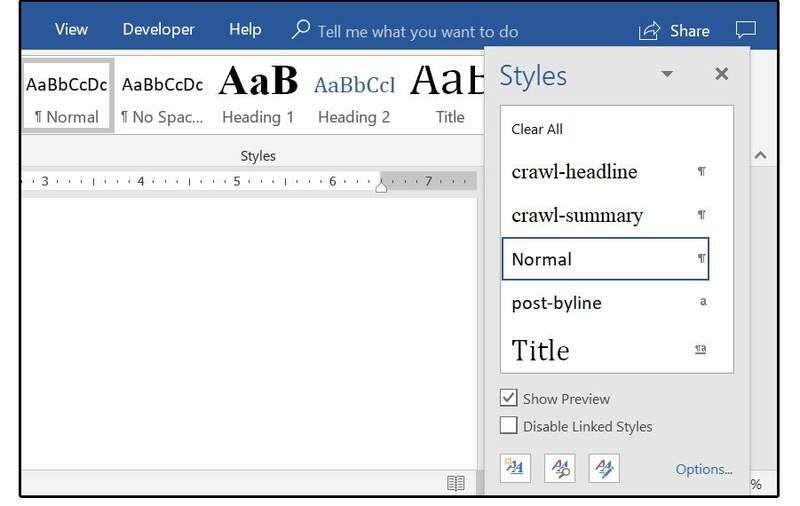 In the Styles Panel, select the New Style button on the bottom left (mouse roll-over displays the button description), and the Create New Style from Formatting screen appears. In the Name field, enter the style name BoxText. 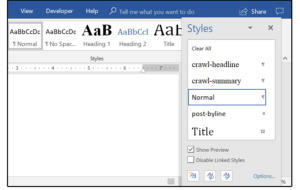 For Style Type, select Paragraph from the drop-down list; in Style Based On, select No Style from the drop-down list; and in the Style for Following Paragraph, select Normal. Later, when you add your own custom body text style (such as BodyText), you can modify this field and re-save. 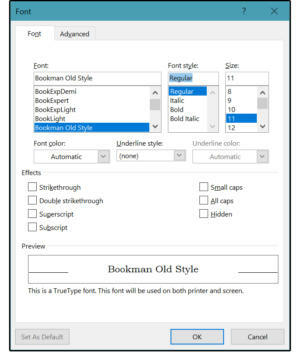 In the Font section under Formatting, select a large serif font like Bookman Old Style. Choose 11 point from the Font Size drop-down list. In the box that says Automatic (color options), choose a dark blue for your font color. Common Character attributes (bold, italic, and underline) are the buttons between the Size and Color fields. The next row of buttons are the most common Paragraph format options: Justification, Line Spacing, Spacing (before and after paragraphs in points), and Paragraph Indents. Note that the Sample text in the large, center panel changes based on your selections, so you can view them live, and the following panel provides a text description of the options you’ve chosen. Next, check Add this style to the Styles Gallery so your styles appear in the style list. Then check Automatically Update so your styles automatically update when changes are made, and then choose the radio button for New Documents Based on this Template, because you plan to use this Style Sheet for your weekly reports. Additional format features and more character and paragraph options reside under the Format menu. Select the Format button, and a drop-down list appears listing the submenus for these extended features and options. 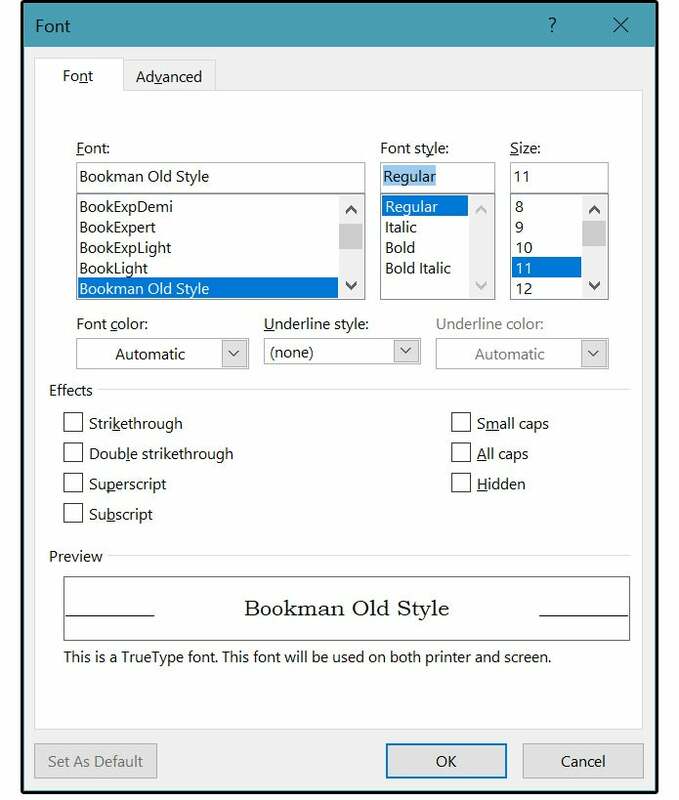 For style sheets, font choices go beyond the font, font style, size, and color you've already set on the previous screen. You'll also set up text effects like strikethrough or underline, and more. It starts with the Format menu, where you select Font. In the Font menu, check the Small Caps box, then click OK. Note that the Underline style option on this Font menu is not for underlining specific words (even though Words Only is an option). You are currently creating a paragraph style, so if you select this option, it will underline the entire paragraph—either one word at a time (if you choose that option) or one long, continuous line. 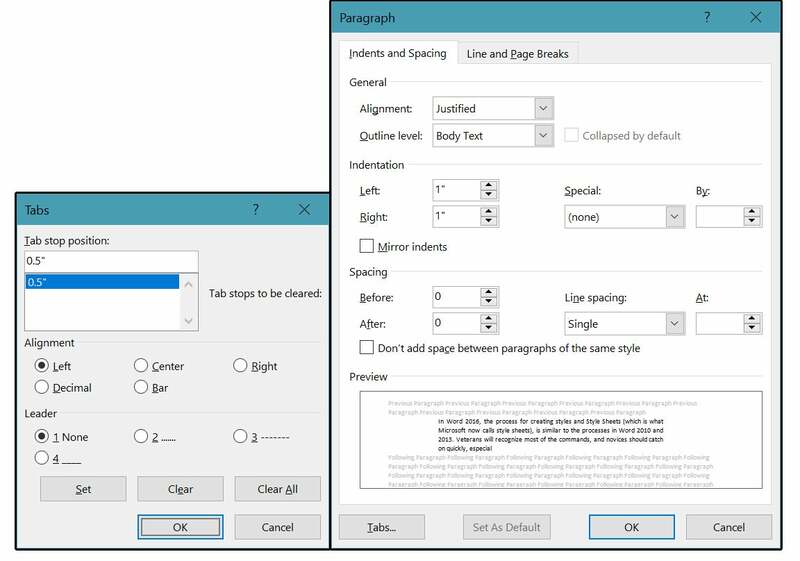 Paragraph format options range from line spacing to alignment, indentations, and more. From the Format menu, select Paragraph. In the Alignment drop-down list, choose Justified, and in the Special drop-down list, choose None. In the Outline Level drop-down list, select Body Text. For both left and right indentation choose 1 inch. For spacing, choose 6 point for Before and After, and for Line Spacing, choose Single. Next, select the Tabs button, which opens the Tabs menu. Enter 0.5” and choose Set, then OK. Note the Alignment and the Leader sections let you customize the tabs for documents such as a table of contents. To add borders to your style sheet, from the Format menu, select Border. 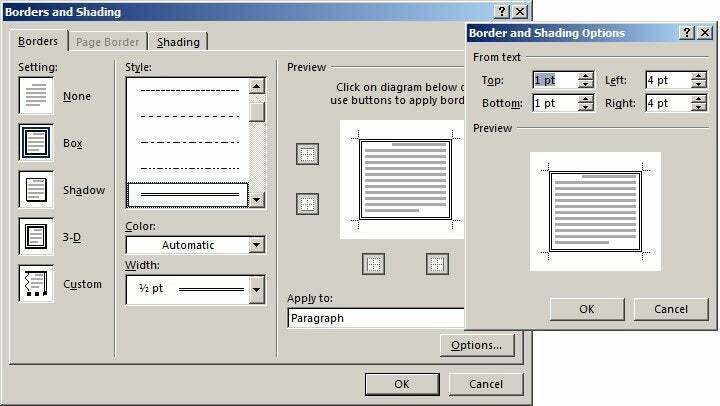 This menu provides border and shade options for your text box. Select Setting: Box, then choose a color and line width. 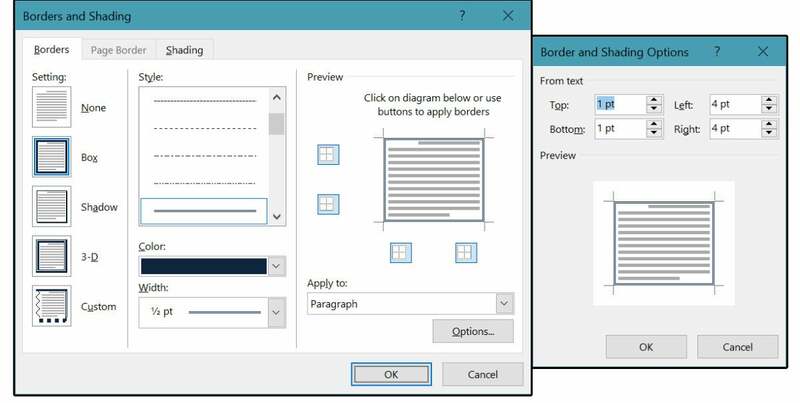 Next, choose the Options button and set the spacing inside the box between the text and the borders. Click OK, and OK again. Other formatting features you might use include Language, Frame, Numbering, Shortcut Key, and Text Effects. Language is obvious. Numbering and Bullets let you choose how your paragraph levels are numbered and aligned—Arabic numbers, Roman numerals, caps, lowercase, periods, etc. The Bullets tab provides options for various bullet designs. You can also create custom number formats and define new bullets from other fonts such as Wing Dings. Frame governs how document text is framed around graphics and/or text boxes, formally known as Text Wrap. This feature is invaluable when creating brochures, newsletters, and other layout designs that incorporate a lot of text and graphics in the same document. Text Effects are artistic options—shadows, gradients, reflections, soft edges, and more—that can give projects a more graphical design appearance. These options are not included in the BoxText style that we’re creating now. Shortcut Keys are quick commands executed by a combination of simultaneous keystrokes, such as Ctrl+B for Bold and Ctrl+I for Italic. This feature lets you create unique shortcut keys for your custom styles. Just enter the combination keystroke in the Press New Shortcut Key field, then click Assign. You will be alerted if you choose a key combination that’s already being used. If the Assign button is not grayed out, you can overwrite this default setting, but I would not recommend it. For the BoxText style, enter Alt+Ctrl+Q. 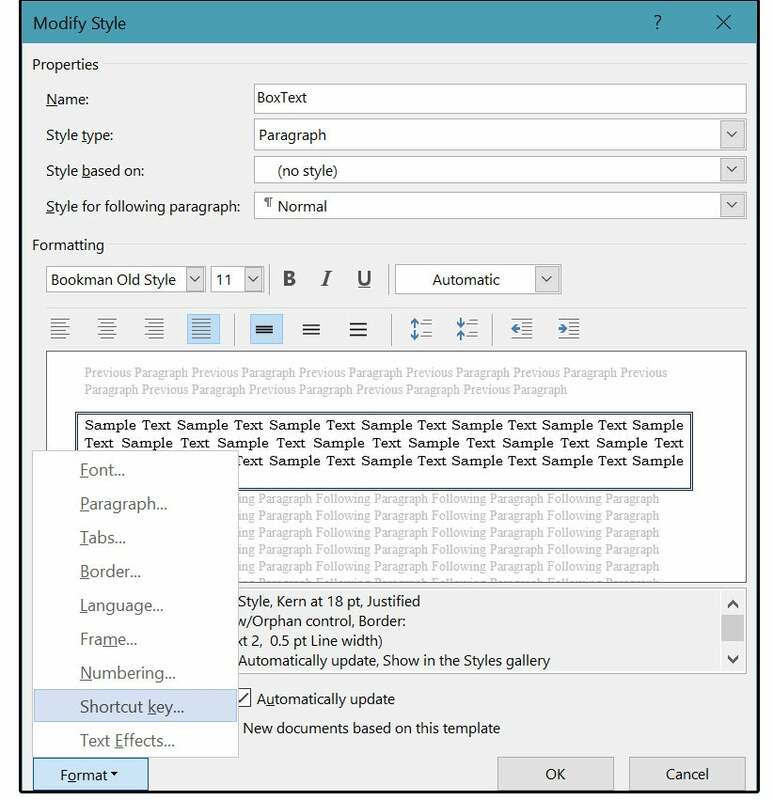 Once all the features and options on the Modify Style menu are complete, click OK and your new style appears in the list of styles on the Style panel. Now, whenever you need this custom text box in the middle of your report, just press Alt+Ctrl+Q and it drops in, ready for new text. But this is just one of the custom styles needed for your new Style Sheet. 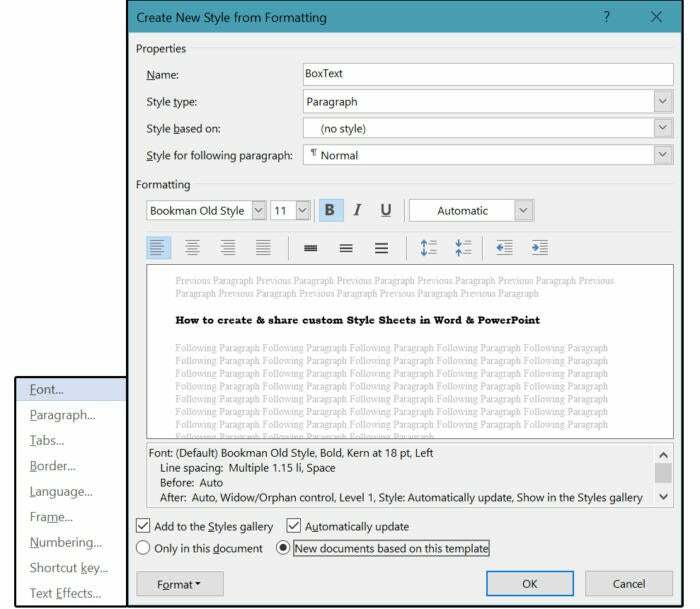 At this point, you can continue creating and defining new styles for your report, or re-save this modified Normal Style Sheet as your CorpReport Style Sheet. Select the Design tab, then click the small down arrow on the right side of the style gallery window. Select Save As New Style Sheet. 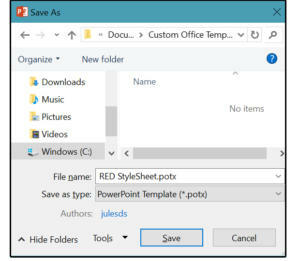 Open the menu again and note that the new Style Sheet is displayed under the Custom banner between the headers called This Document and Built-In. In the File Name field, enter the Style Sheet name CorpReport. Check the Save Thumbnail box, then click Save. Once your CorpReport Style Sheet is complete, it’s time to email a copy to the other branch offices. Open a new email and address it. Click the attachment icon in your email client and then navigate to the Users/username/AppData/Roaming/Microsoft/Quick Styles folder on your hard drive. Select the CorpReport.dotx file. In the body of the email message, instruct the recipients to copy this file into the same folder on their hard drives. 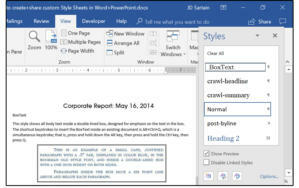 When they open the report in Word, if the Style Sheet is not already attached to the document, they just need to go to the Design tab, scroll over to the CorpReport Style Sheet in the Style gallery box at the top (mouse roll-over displays the style names), click that thumbnail, and then watch the document reformat right before their eyes. 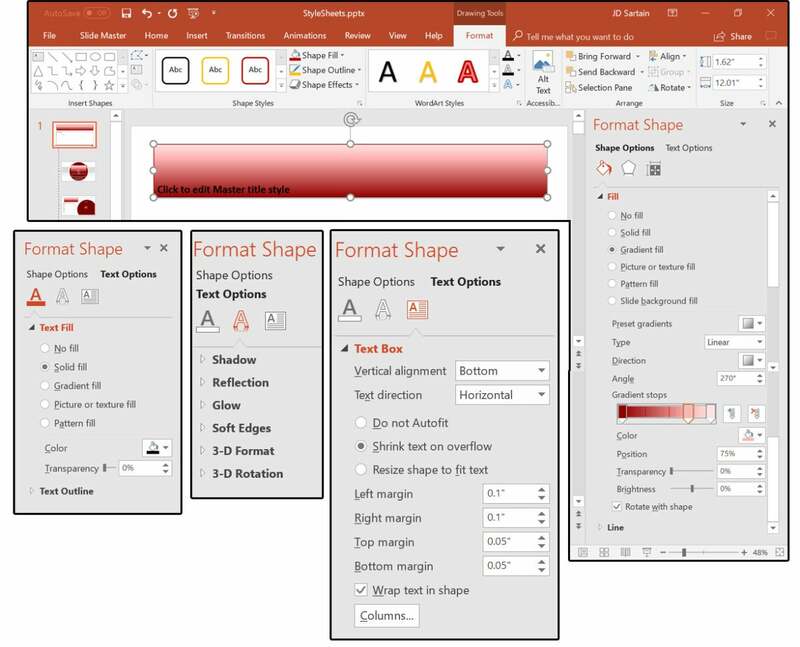 Style Sheets in PowerPoint are a little different from Word because of their opposite tendencies. PowerPoint focuses more on graphics, with minimal text for titles, headers, bullet points, and brief statements, while Word’s focus is the text with an occasional graphic. Also, PowerPoint encourages the use of templates, which already have Style Sheets and Design features attached. You can either choose an existing template and modify it to your specific needs (easiest method) or create a new template and build the Style Sheet and Design features yourself. 1. 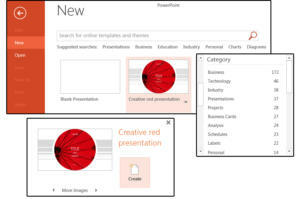 Open PowerPoint, select New from the backstage panel, then choose Business (templates) from the Suggested Searches field. 3. For this exercise, choose the template titled: Creative Red Presentation. 4. 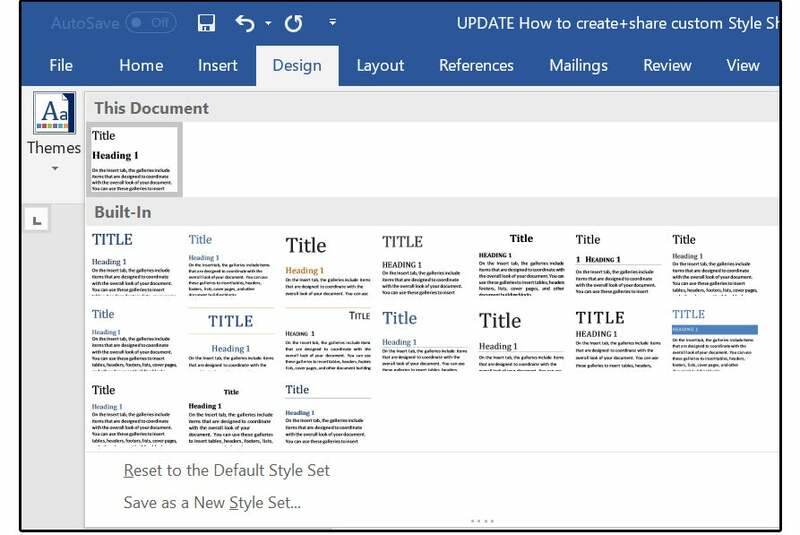 When the dialog opens, click the Create button and PowerPoint builds the template presentation with multiple different slides, designs, and Styles. 5. 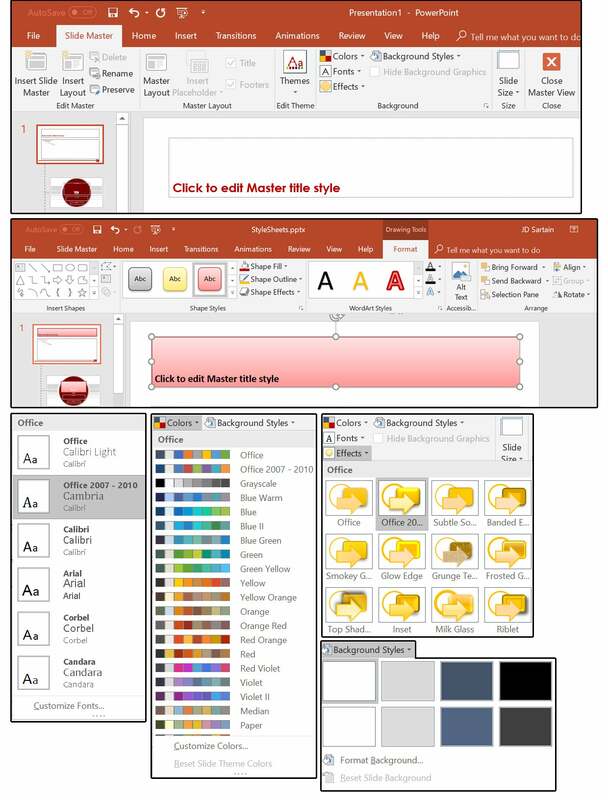 You can modify the Style Sheet of your presentation through the Slide Master. 7. Notice the first text box says, Click to edit Master Style. 8. Click whichever text box you want to change, then select new fonts, colors, and background styles from the Slide Master > Background group. 9. Notice that when an object is selected, the Ribbon menu shows a new tab called Drawing Tools Format. Click this tab to change the Shape Styles of any graphics and/or shapes on the slide. 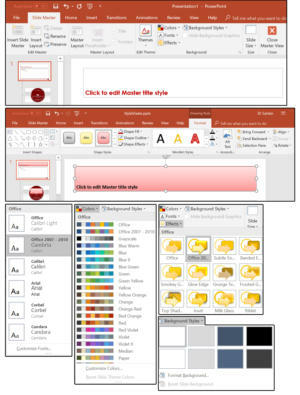 Options here include Insert Shapes, Shape Styles (Fill, Outline, and Effects), WordArt Styles, plus the Arrangement of objects on the slide such as Bring Forward, Send Backward, Align, Group, and Rotate. 10. Once you make the changes to one slide in the Slide Master, PowerPoint updates all the others automatically. Just click the object or text on the slide you want changed, then click the Drawing Tools Format tab. 11. You can change the styles through the Ribbon buttons or click the expansion arrow at the bottom right corner of the Shape Styles group and the Format Shape > Shape Options or Text Options pane appears on the right side of the screen. 12. Select Shape Options to change the Fill, Gradient, Image Fill, Pattern Fill, Slide Background Fill, Preset Gradient settings, and Line. 13. 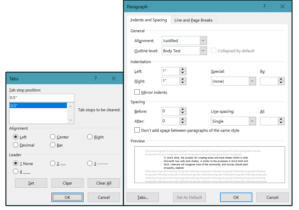 Select Text Options to change the fill of your text; for example, you might choose a Picture or Texture fill to place an American Flag inside the uppercase 'A' of the word America. 14. Scroll through the various Shape and Text panes to further customize this style. 15. When finished, select File > Save As. 16. Navigate to C:\Users\<your username>\Documents\Custom Office Templates. 17. 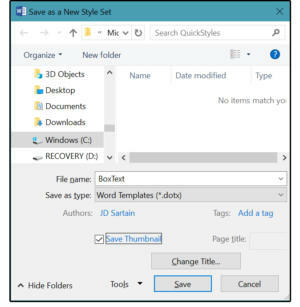 Enter a new name for this style/template in the Save As dialog's File name field. 18. And last, select PowerPoint Template in the Save As type list, and click Save. This article originally published May 20, 2014, and has been updated to reflect the current version of Office.